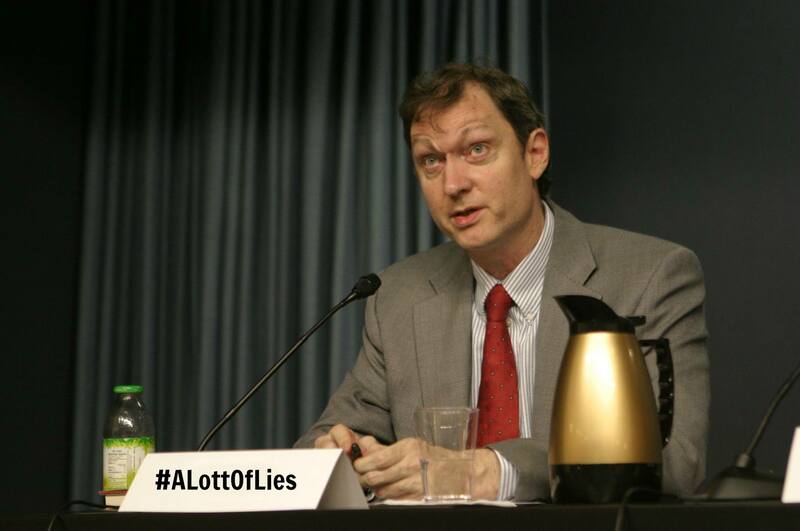 Lott’s claim is categorically false. According to the September 2017 audit of the NICS Background Check system conducted by the Office of the Inspector General (OIG), 99.8% of background check denials were accurate. This was in line with the FBI’s own quality control estimate of a 99.3–99.8% accuracy rate for 556,496 denied transactions from 2008 to 2014. This high accuracy rate is the complete opposite of Lott’s contention. In addition, Lott’s lackluster analysis fails to recognize that the root of the low prosecution rate of NICS perjury cases he describes is due to a critical lack of funding for the Bureau of Alcohol, Tobacco, Firearms and Explosives (ATF) and an overcrowded federal court system, which severely limits prosecutions of criminals who lie on the background check form. David Chipman, a former ATF agent, explains that the reason for the low prosecution rate is because the ATF has very limited resources and must triage cases. Law enforcement focuses on cases where a criminal was mistakenly allowed to obtain a firearm. Even then, pressing charges is rare if the firearm is retrieved without further incident. To make matters worse, current law allows a prohibited purchaser to simply claim that lying on the background check form was not intentional, making successful prosecution nearly impossible. Due to these limitations, Chipman describes the current background check system as a shield rather than a sword: extremely effective at blocking dangerous individuals from obtaining guns but with little power to punish them for lying on the forms. Even though the background check system is accurate, the OIG audit does reveal that some prohibited buyers are able to slip through the system and purchase a firearm at a licensed dealer. These errors mostly stem from incomplete and byzantine record keeping at the local level. Although still relatively rare, as the report notes, even a single error of this type can have catastrophic consequences, such as allowing the 2015 Charleston shooter to purchase his firearm. The gun lobby has done everything in its power to make the ATF as impotent as possible, preventing the ATF from being merged with a non-hobbled agency, and then uses the ATF’s weaknesses as a poster child for why government regulation of firearms is doomed to fail. John Lott has a long and well-documented history of peddling alternative facts, fabricating data, and even adopting the persona Mary Rosh to defend his own work. In order to progress with proven measures to reduce gun violence such as Permit-to-Purchase laws and closing numerous NRA-sponsored loopholes in our current laws, we must dispel dangerous fictions such as Lott’s which degrade public safety. Devin Hughes, CFA is the President of GVPedia.